Yoga is a form of exercise that can help with Osteoporosis, one of the most widespread chronic conditions in the Western hemisphere. How does yoga help counteract the effects of bone loss and osteoporosis? In this interview, Dr. Loren Fishman and Ellen Saltonstall, co-authors of Yoga for Osteoporosis, discuss the results of Dr. Fishman's study on yoga for osteoporosis and some of the considerations and precautions for people with osteopenia or osteoporosis considering a yoga practice. Eva Norlyk Smith: You have written a book on Yoga for Osteoporosis and have conducted a major study on the bone-building benefits of yoga for osteoporosis. What made you interested in this subject in the firsts place? Loren Fishman: Osteoporosis is one of the most widespread chronic conditions in the Western hemisphere, and it’s hard to exaggerate its health effects. Osteoporosis affects 44 million Americans. That’s more than half of everyone over the age of 50. It is 50 percent of all women of whatever age and 25 percent of all men. It affects over 200 million people worldwide. So this is big time. Osteoporosis causes a million fractures each year, most of which are vertebral fractures and about 300,000 are hip fractures. We worry so much about breast cancer in women, however, in actuality the risk of a hip fracture is equal to the combined risk of breast, uterine and ovarian cancer. And it’s not just women who are at risk. For men over 50, even though we hear a lot about prostate cancer, men over 50 are actually more likely to have a hip fracture than prostate cancer. Fully 25% of the people that have hip fractures die. Another 25 percent enter a nursing home never to leave, so half of people who contract a hip fracture have a very significant life change. Eva Norlyk Smith: How does yoga help counteract osteoporosis? Loren Fishman: Well, let me count the ways. Most people have heard of Wolff’s law: The architectonic, the structural support of bone, follows the lines of force to which that bone is exposed. When bone cells get stimulated through being compressed or twisted or elongated, they produce more bone mass until that bone gets strong enough, to resist the pressure. At that point the pressure no longer distorts the bone, and the bone-making cells stop making more. What a wonderful feedback system. In osteoporosis, the bones bend more, so pressure is more effective in stimulating the cells to make bone. In short, like weight training, yoga works by stressing the bone. Yoga stimulates the bone with isometric contraction at almost every conceivable angle for long periods of time. Ellen Saltonstall: What is often overlooked in modern weight-training exercise and certainly when evaluating the effects of osteoporosis drugs, is that there is a difference between structure and density. Dexa scans will get a measurement of density, but they tell us nothing about the structure of the bone. Dense bone mass on its own doesn’t necessarily provide protection against fractures; unless the bone fibers are laid down in a way to provide greater strength, the bone mass is not going to be very stable It’s like the difference between a pile of steel beams and the George Washington Bridge. A bridge has been planned by engineers, so the beams, when put together, create a well-organized, completely integrated structure, which can sustain huge amounts of weight—because of the strength created by the structural interconnections. In short, density and structure both matter for bone health. But unfortunately, we don’t have convenient ways to measure the structure of bones as of yet. We do have straightforward ways to measure the density. The osteoporosis drugs do work, they reduce the risk of fracture considerably, but the functional limitations of just building bone mass without proper structure and strength are completely ignored. Loren Fishman: Yoga helps grow bone mass, but because yoga poses pull and stretch the bones from every conceivable angle, yoga also may stimulate the formation of a bone structure that is able to resist greater amounts of pressure, as well as many different types of challenges. As we discuss in our course, there are numerous other important ways in which yoga benefits people with osteoporosis, such as improving balance, muscular strength, range of motion and coordination, while lessening anxiety. These are other important benefits of yoga for people with osteoporosis because they each help reduce the risk of falling. Eva Norlyk Smith: Many yoga teachers and yoga practitioners operate under the assumption that twisting poses should be avoided by people with osteoporosis. Yet, you say that twists are okay, even important for people with osteoporosis. Could you elaborate on that? Ellen Saltonstall: It is true that many people think that twists are contraindicated. However, we have found that twists are very beneficial and carry little, if any, risk. Twists give such a symmetrical pressure to the vertebral body that it’s not a fracture risk. And even though doctors caution their patients with osteoporosis never to do any twisting, there seems to be no actual evidence that twists are bad in and of themselves. Of course, if you’re twisting and lifting something at the same time, it’s a different story. However, yoga twists, as I said, provide such a symmetrical pressure, we feel that gentle, supported twists are safe to do as part of one’s yoga practice. And they are very important exercises for osteoporosis, because they give such a complete stimulus to the vertebral body. Loren Fishman: If you have certain other spine conditions, like a herniated disk, twists can be a problem. However, if all you have is osteoporosis, there’s almost no other way of developing strength and stimulate bone growth than exposing that vertebra to some pressure. We do have to avoid forward bends in people with osteoporosis, and the side bends they can do are limited. So twisting the vertebra is one of the few ways to get all of the vertebrae under some compression and stimulate bone growth in the vertebrae. This is extremely important, because so many osteoporosis fractures happen in the vertebrae. 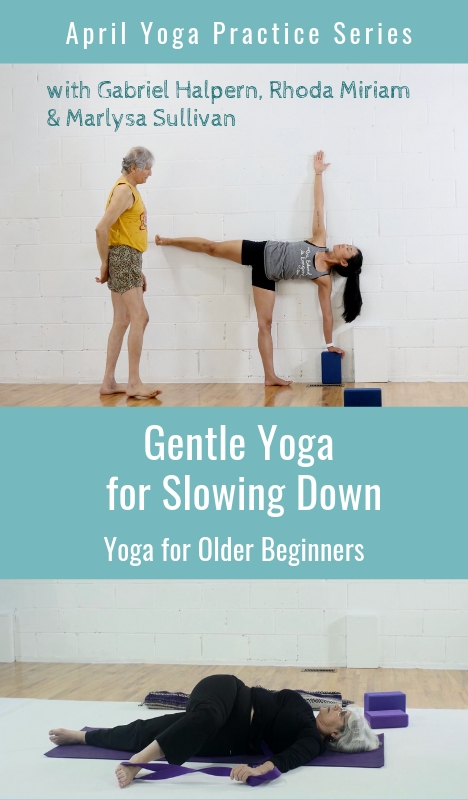 Over the last 10 years, we have given yoga practices including twists to many, many people, generally over the age of 65, almost all of whom have had significant osteoporosis. This has been well over 30,000 hours of yoga. There hasn’t been a single incidence of fracture, In fact, nothing bad has happened. We haven’t had one thing go wrong. This is something that both yoga teachers and yoga practitioners should know. Ellen Saltonstall: Of course, the key to getting the benefits of yoga for osteoporosis is to ensure that the yoga postures are done with proper alignment. Every joint in the body and every part of the body has an optimal alignment and this is a scientific process. There are several yoga styles that emphasize this precision of alignment. If the joints are aligned properly, not only do you get best stimulus of the bones, but you have much better balance too. So one example is the tops of the arms and the tops of the legs, i.e. the upper arm bone and the thigh bone, both move back in the sockets of the joints and when they are rooted firmly in the sockets of the joints, the congruency of the joints is better, it’s stronger. Another example of an alignment that we often use is that the chest bones lifts up, and this prevents that stoop forward posture that is commonly seen in osteoporosis. So those are just two examples of alignment, of course, there are a lot of alignment-based instructions that we give when teaching people with osteoporosis that are key to getting the best, and safest, results. For people with osteoporosis, simply practicing yoga, without proper attention to alignment, might not be such a good idea. Nothing in this interview should be construed as medical advice. Osteoporosis is a serious condition, always consult a doctor about any medical concerns and before starting any exercise regimen. Dr. Fishman is an M.D. and an Iyengar-trained yoga teacher, as well as the managing partner of Manhattan Physical Medicine and Rehabilitation. Ellen Saltonstall is an author, a yoga therapist, a senior certified Anusara yoga teacher and she holds a master’s degree in the field of therapeutic movement education.